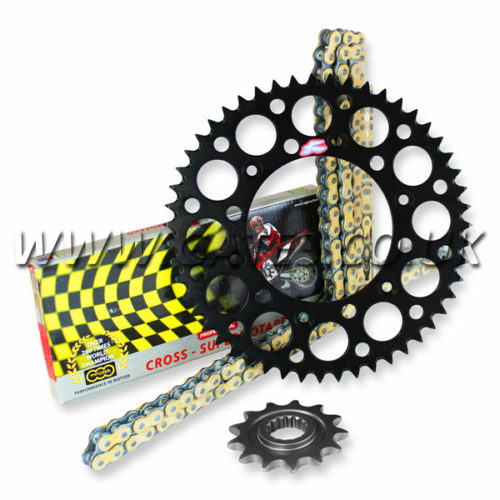 This kit includes: 1 x Regina ORN-6 520 x 118 link gold O’ring chain with split link, 1 x case hardened steel front sprocket and 1 x Renthal Ultralight black rear sprocket. The choice of champions: with over 300 world titles to their name, Regina are the number #1 choice for many race teams across the world. Regina’s ORN-6 chain is of the latest generation characterised by new and better performing round section O’rings. Light and strong, these sealed chains are engineered to meet the demands of road and off road riders. 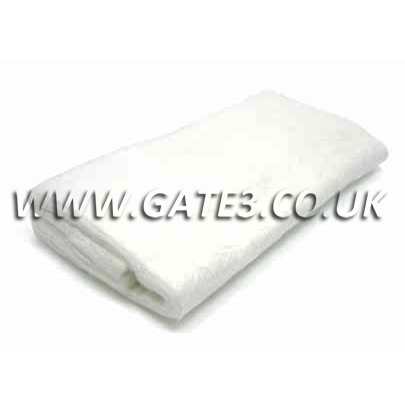 Features include gold outer plates, high carbon alloy pins, solid bushing, shot-peened plates and rollers. All O’ring chains are submitted to performance enhancing pre-stretching. Regina O’ring chains offer a huge improvement in wear compared to standard type chains. Front sprockets are CNC machined from high tensile steel and case hardened to resist wear. Some sprockets feature lightening holes on selected models but only when durability will not be affected. Renthal Ultralight Chain wheels are chosen by more factory Motocross and Supercross teams than any other brand on the market. The rear chain wheels are CNC machined to offer the greatest concentricity and optimum tooth profile for increased life and durability. Through the CNC machining process, we are able to create and extremely lightweight rear chain wheel which reduces revolving unsprung weight and increases the power transfer to the rear wheel. Standard gearing for your model is: 1983 to 1996: 13T front sprocket and 51T rear sprocket. 1997: 12T front sprocket and 49T rear sprocket. 1998 to 1999: 13T front sprocket and 51T rear sprocket. 2000 to 2001: 13T front sprocket and 52T rear sprocket. 2002: 13T front sprocket and 51T rear sprocket. 2003: 13T front sprocket and 52T rear sprocket. 2004: 13T front sprocket and 53T rear sprocket. 2005 to 2007: 13T front sprocket and 52T rear sprocket. 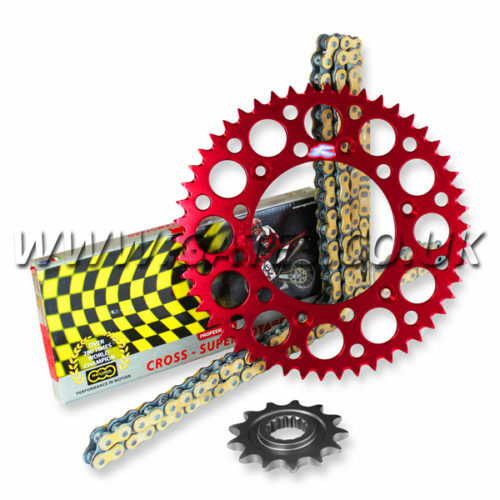 This kit includes: 1 x Regina ORN-6 520 x 118 link gold O’ring chain with split link, 1 x case hardened steel front sprocket and 1 x Renthal Ultralight red rear sprocket. The choice of champions: with over 300 world titles to their name, Regina are the number #1 choice for many race teams across the world. Regina’s ORN-6 chain is of the latest generation characterised by new and better performing round section O’rings. Light and strong, these sealed chains are engineered to meet the demands of road and off road riders. 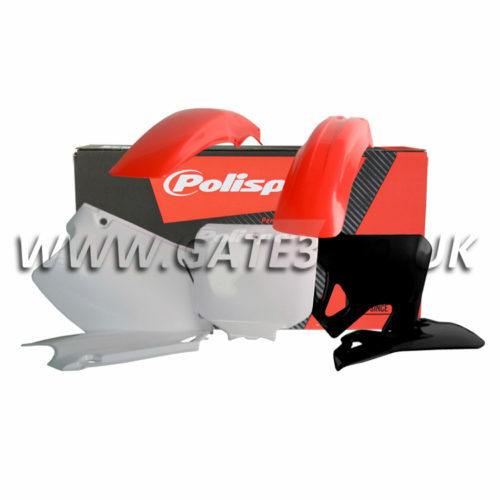 Features include gold outer plates, high carbon alloy pins, solid bushing, shot-peened plates and rollers. All O’ring chains are submitted to performance enhancing pre-stretching. Regina O’ring chains offer a huge improvement in wear compared to standard type chains. Front sprockets are CNC machined from high tensile steel and case hardened to resist wear. Some sprockets feature lightening holes on selected models but only when durability will not be affected. Renthal Ultralight Chain wheels are chosen by more factory Motocross and Supercross teams than any other brand on the market. The rear chain wheels are CNC machined to offer the greatest concentricity and optimum tooth profile for increased life and durability. Through the CNC machining process, we are able to create and extremely lightweight rear chain wheel which reduces revolving unsprung weight and increases the power transfer to the rear wheel. Standard gearing for your model is: 1983 to 1996: 13T front sprocket and 51T rear sprocket. 1997: 12T front sprocket and 49T rear sprocket. 1998 to 1999: 13T front sprocket and 51T rear sprocket. 2000 to 2001: 13T front sprocket and 52T rear sprocket. 2002: 13T front sprocket and 51T rear sprocket. 2003: 13T front sprocket and 52T rear sprocket. 2004: 13T front sprocket and 53T rear sprocket. 2005 to 2007: 13T front sprocket and 52T rear sprocket. 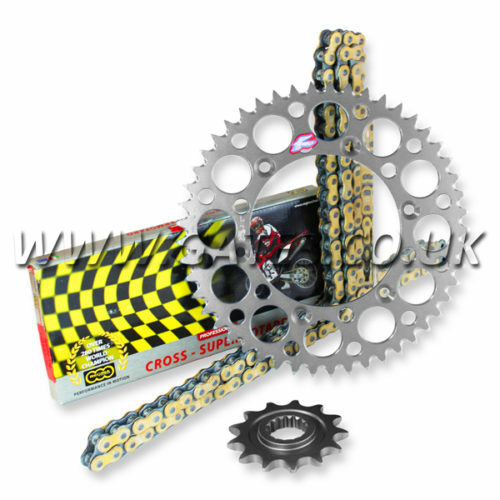 This kit includes: 1 x Regina ORN-6 520 x 118 link gold O’ring chain with split link, 1 x case hardened steel front sprocket and 1 x Renthal Ultralight silver rear sprocket. The choice of champions: with over 300 world titles to their name, Regina are the number #1 choice for many race teams across the world. Regina’s ORN-6 chain is of the latest generation characterised by new and better performing round section O’rings. Light and strong, these sealed chains are engineered to meet the demands of road and off road riders. 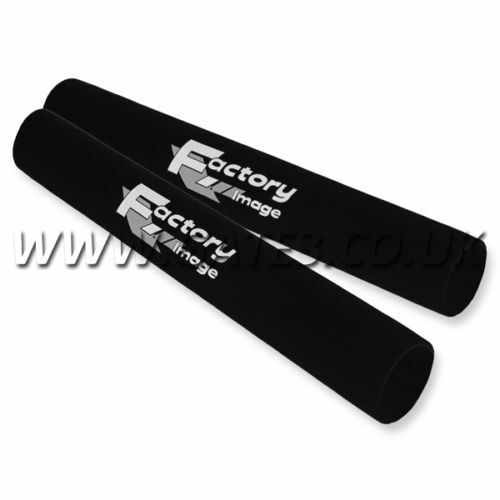 Features include gold outer plates, high carbon alloy pins, solid bushing, shot-peened plates and rollers. All O’ring chains are submitted to performance enhancing pre-stretching. Regina O’ring chains offer a huge improvement in wear compared to standard type chains. Front sprockets are CNC machined from high tensile steel and case hardened to resist wear. Some sprockets feature lightening holes on selected models but only when durability will not be affected. Renthal Ultralight Chain wheels are chosen by more factory Motocross and Supercross teams than any other brand on the market. The rear chain wheels are CNC machined to offer the greatest concentricity and optimum tooth profile for increased life and durability. Through the CNC machining process, we are able to create and extremely lightweight rear chain wheel which reduces revolving unsprung weight and increases the power transfer to the rear wheel. Standard gearing for your model is: 1983 to 1996: 13T front sprocket and 51T rear sprocket. 1997: 12T front sprocket and 49T rear sprocket. 1998 to 1999: 13T front sprocket and 51T rear sprocket. 2000 to 2001: 13T front sprocket and 52T rear sprocket. 2002: 13T front sprocket and 51T rear sprocket. 2003: 13T front sprocket and 52T rear sprocket. 2004: 13T front sprocket and 53T rear sprocket. 2005 to 2007: 13T front sprocket and 52T rear sprocket. This kit includes: 1 x Regina RX3 Professional 520 x 118 link gold chain with split link, 1 x case hardened steel front sprocket and 1 x Renthal Ultralight black rear sprocket. The choice of champions: with over 300 world titles to their name, Regina are the number #1 choice for many race teams across the world. Regina are constantly updating the RX3 Professional chain to ensure the highest standard of strength and wear resistance required in any application. Regina’s RX3 Professional chains use extended curl-formed bushings, shot peened solid rollers and steel plates for increased fatigue resistance and performance enhancing pre-stretched gold plates. 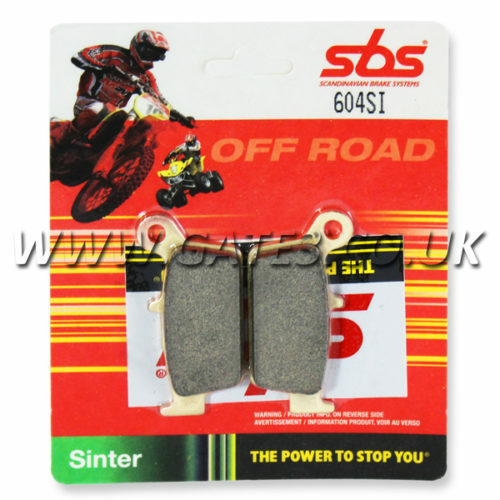 Special “X” chromized pins and linkplates with special bevel that provides sure engagement with sprockets even in the most difficult conditions, such as in off-road use. Front sprockets are CNC machined from high tensile steel and case hardened to resist wear. Some sprockets feature lightening holes on selected models but only when durability will not be affected. Renthal Ultralight Chain wheels are chosen by more factory Motocross and Supercross teams than any other brand on the market. The rear chain wheels are CNC machined to offer the greatest concentricity and optimum tooth profile for increased life and durability. Through the CNC machining process, we are able to create and extremely lightweight rear chain wheel which reduces revolving unsprung weight and increases the power transfer to the rear wheel. 1983 to 1996: 13T front sprocket and 51T rear sprocket. 1997: 12T front sprocket and 49T rear sprocket. 1998 to 1999: 13T front sprocket and 51T rear sprocket. 2000 to 2001: 13T front sprocket and 52T rear sprocket. 2002: 13T front sprocket and 51T rear sprocket. 2003: 13T front sprocket and 52T rear sprocket. 2004: 13T front sprocket and 53T rear sprocket. 2005 to 2007: 13T front sprocket and 52T rear sprocket. This kit includes: 1 x Regina RX3 Professional 520 x 118 link gold chain with split link, 1 x case hardened steel front sprocket and 1 x Renthal Ultralight red rear sprocket. The choice of champions: with over 300 world titles to their name, Regina are the number #1 choice for many race teams across the world. Regina are constantly updating the RX3 Professional chain to ensure the highest standard of strength and wear resistance required in any application. Regina’s RX3 Professional chains use extended curl-formed bushings, shot peened solid rollers and steel plates for increased fatigue resistance and performance enhancing pre-stretched gold plates. Special “X” chromized pins and linkplates with special bevel that provides sure engagement with sprockets even in the most difficult conditions, such as in off-road use. Front sprockets are CNC machined from high tensile steel and case hardened to resist wear. Some sprockets feature lightening holes on selected models but only when durability will not be affected. Renthal Ultralight Chain wheels are chosen by more factory Motocross and Supercross teams than any other brand on the market. The rear chain wheels are CNC machined to offer the greatest concentricity and optimum tooth profile for increased life and durability. Through the CNC machining process, we are able to create and extremely lightweight rear chain wheel which reduces revolving unsprung weight and increases the power transfer to the rear wheel. This kit includes: 1 x Regina RX3 Professional 520 x 118 link gold chain with split link, 1 x case hardened steel front sprocket and 1 x Renthal Ultralight silver rear sprocket. The choice of champions: with over 300 world titles to their name, Regina are the number #1 choice for many race teams across the world. Regina are constantly updating the RX3 Professional chain to ensure the highest standard of strength and wear resistance required in any application. Regina’s RX3 Professional chains use extended curl-formed bushings, shot peened solid rollers and steel plates for increased fatigue resistance and performance enhancing pre-stretched gold plates. 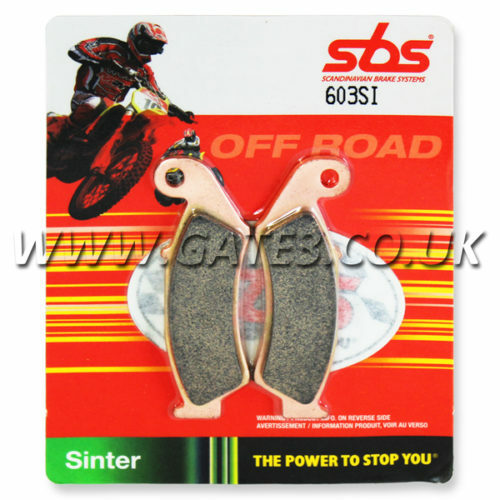 Special “X” chromized pins and linkplates with special bevel that provides sure engagement with sprockets even in the most difficult conditions, such as in off-road use. Front sprockets are CNC machined from high tensile steel and case hardened to resist wear. Some sprockets feature lightening holes on selected models but only when durability will not be affected. Renthal Ultralight Chain wheels are chosen by more factory Motocross and Supercross teams than any other brand on the market. The rear chain wheels are CNC machined to offer the greatest concentricity and optimum tooth profile for increased life and durability. Through the CNC machining process, we are able to create and extremely lightweight rear chain wheel which reduces revolving unsprung weight and increases the power transfer to the rear wheel.